The Charleston County Parks and Recreation Commission brings Louisiana to the Lowcountry! 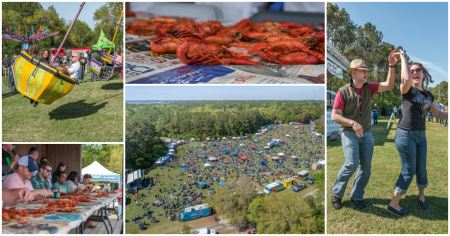 The Lowcountry Cajun Festival is a full-day of Zydeco music, Cajun and Creole foods, kids activities, and all around ragin’ Cajun fun! Savor the tastes of authentic Cajun and Creole fare – jambalaya, alligator, etouffe, andouille sausage, and crawfish. Also enjoy Lowcountry favorites like seafood and Southern barbecue. For those who prefer a tamer menu, we’ll serve up ample portions of festival foods like hot dogs, sno cones, and more. If you’re a connoisseur, the 2:30 pm crawfish-eating contest is the perfect opportunity to show off your unique talent! Carnival rides, inflatable games, and carnival games – all-day and unlimited for just $15 per child.